Le Diable a Quatre. Ballet D'Ad. Adam. 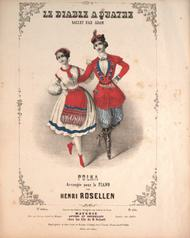 Polka. Arrangee pour le Piano par Henri Rosellen. Published [n.d.] by B. Schott in Mayence. Composition of sectional with piano instrumentation. Subject headings for this piece include Portraits, Couples, Folk dancing, Native dress.